My dad has always told me that something free is worth saving up for. (Or something like that!) So, when a new-to-me author, Jennifer L. Hart, was offering a chance to win a free copy of one of her books, I couldn’t resist entering. Not only did I win, but I was given the opportunity to pick which one I would like! My choice was Stellar Timing. 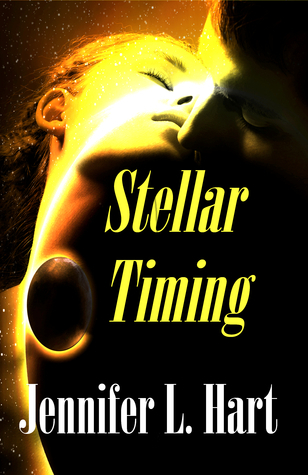 This story is a mix of fantasy, science fiction, and romance, and it’s addictive. The narration drew me in immediately and I had a very hard time putting it down. Or, rather, putting my phone down, as I was listening to the book on the Audible app there. Rather than a universe, in Stellar Timing, there is a multiverse. To the other planets in the multiverse, Earth is what Australia started out to be here on our planet: a penal colony. After being deceived and cheated out of his throne by a duplicitous sorceress, Prince Brennigan is banished to Earth. He lands on Ellie McIntyre’s doorstep a bloodied mess with few memories of what happened to bring him there. Ellie is startled by his unconventional arrival – to say the least! Not only does it through her for a loop, but it also awakens her own magic that she knew nothing about. Accompanied by his shape-shifting siblings, Snark and Sass (aren’t those the best names?! ), Brennigan embarks on a mission to convince Ellie to return to his planet and help defeat the sorceress Macara. With a little help from her grandmother – a witch herself – Ellie manages to learn enough to open an inter-planetary portal, dropping herself, Brennigan, Snark, and Sass back on Terrin. There, the journey truly begins. I don’t often listen to books, preferring instead to read the words, but I was so absorbed by Stellar Timing that I was happy to have an audio book. The narration was read quite well enough so that I could follow the speakers and the action of the plot. The more I read from Jennifer L. Hart, the more I like her and her writing. She weaves together humor and a strong spark of creativity to really create a rich, full scene in her books. My thanks, again, to the author for the gift of this truly one-of-a-kind read. Bwahahaha! Way to quote dad, Jenna!